We love to travel. We've always loved to travel. But our days of getting off the plane in some distant land with no place to stay and no plans ended with the arrival of Big C&G in 2002 and Little C&G in 2005. It took us a few years to figure out that we could still travel with our boys in tow, and that "plan" didn't need to be a nasty four letter word. I realized we could get out there and show them the world, we'd just need to do a little research before packing up our suitcases. So in the interest of self preservation, I soon became obsessed with travel planning. I scoured the internet, pulled articles out of magazines, read through countless travel books, and studied google maps like I was on a military mission. I found a lot of the information about traveling with your kids involved trips to Florida or theme parks, and other places I prefer to avoid. But I wanted to know what do we do with our kids in Montreal? Or Scandinavia? Or Boston, now that they've outgrown the Children's Museum? With all my research I was able to pull together itineraries that would make all four of us happy. Good food, cultural discoveries, and swanky bars could still be part of our experiences. What I didn't realize is that while I have grown to love the planning part of our travels, most everyone I talked to hated it. The stress of trying to make choices when faced with limited or limitless possibilities can be paralyzing. But after adventures with our kiddos in 11 European countries, across Canada, Mexico, and the United States, I've come up with a formula for success. My secrets to happy family travels are: Research. Cocktails. And gelato. Research, because we don't have an unlimited budget and I'd like to avoid costly and energy draining mistakes. I've decided to blog about our adventures, the choices I've made, what the kids have loved (and not loved) in the hopes that other families will be inspired to get out and explore the world. With some well researched and field tested ideas, think of C&G as your personal family travel concierge. Cocktails, because at the end of the day when you've wandered across cobblestones, toured scenic landmarks, scavenger hunted your way around world class museums, you've earned yourselves a cocktail. Nothing is more rejuvenating than finding an outdoor sidewalk cafe where you can order some drinks and sit back to watch the world go by while your kiddos play with whatever $5 trinket you've let them buy at the museum gift shop. 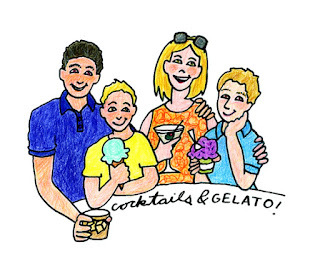 And gelato, because kids have a built in radar for tracking down sugary treats, no matter what language they need to decipher to get them. You've made the kids part of the adventure, they can try out their navigation skills, and they get to be in charge for a small part of their day. And really, is there any problem in the world that a cup of stracciatella can't solve?